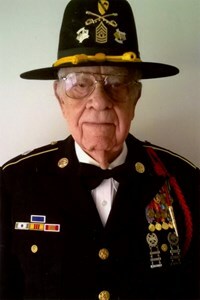 Harry Samuel Shakes, Command Segeant Major, U.S. Army (Ret) of Winter Park, FL passed away on February 6, 2019. Harry was born September 1, 1922 in Gurio Oriente, Cuba and later grew up in Jamaica, British West Indies. The oldest child of the late William and Victorine Shakes, Harry came to the United States in 1943. He was drafted later that year and spent the next thirty years in the United States Army. He was among the first wave to land at Normandy on Omaha Beach on D-Day. He then served in France and Germany during WWII. Harry also was among the first wave in the Korean War with the First Calvary Division. He also served in the Vietnam War. Harry is the recipient of the Bronze Star Medal, twice for valor, and the Purple heart, twice for wounds suffered in combat, the Army Meritorious Service Medal twice, the combat Infantry Badge twice, and numerous other awards and decorations. Harry has stated that of the many proud days in his life, the happiest was the day he proposed to a young student nurse at the Burbank Nursing School in Fitchburg, Massachusetts while he was stationed at Fort Devens, MA. Joyce accepted his proposal and they were together in marriage for fifty-three years, until she passed away in 2007. He was also very happy on the day he became an American citizen. He was blessed with great happiness and pride, when his two sons, David and Dale were born, and proud on the day he was promoted to the highest enlisted grade of Command Sergeant Major in the United States Army. After his retirement from the service, he worked 16 years for Martin Marietta as a logistic technician, and he always found time to remain active in his church and in other Veteran's activities. He will be fondly remembered as being friendly, kind, and polite to all those who knew him. Harry is survived by his two sons, David of Colorado Springs, CO, and Dale of Winter Park, FL. He is also survived by David's wife, Sandra, their children, Andrew, Leigh, and Lauren, all of Colorado Springs, CO; a sister, Lorel Shakes of London, England; and several nieces and nephews. A memorial service will be held at the Aloma Methodist Church in Winter Park, located at the corner of Aloma Avenue and Semoran Boulevard. A reception will follow in the Fellowship Hall at the church. In lieu of flowers, donations to the United Methodist Children's Home in Enterprise, FL, or to any of the missionary activities of the Aloma United Methodist Church would be greatly appreciated. Add your memories to the guest book of Harry Shakes. I was Blessed to be Command Sergeant Major Harry Shakes Guardian on my first Honor Flight to the Veterans Memorials in Washington D.C. Every year since then I would arrange for Harry and other WWII veterans to attend the Army, Navy and Marine Corp Balls. Harry really looked forward to attending the Balls and everyone there looked forward to seeing him and the other WWII Veterans. We would talk about his military career having served in WWII, Korea and Vietnam. My dad passed 4 years ago and after that Harry would call me son and I would call him dad. Harry loved Jamaican food and I would bring him his favorites snapper and kingfish from the Jamaican restaurant which he truly enjoyed. My sincerest condolences to David, Dale, the entire Shakes family and relatives. Command Sergeant Major Harry Shakes you are now relieved of all duties and our Nation thanks you for a job well done, Mission accomplished Sir. You may be gone but you will never be forgotten. One day we will meet again on the other side. Uncle Harry as my dad Tony would say .May your soul rest in peace .You are the epitome of braveness ,and I enjoyed every moment you visited Jamaica. sharing your army life with us your grandneices and grand nephews were what we look forward to accompanied by your encouraging word .sleep in peace grand uncle from your grandneice tarama .Daughter of your nephew Tony. Harry Shakes our beloved uncle, grand uncle a stalwart indeed. We remember the many times you and your sons Dale and David visited us in Cameron Hill, St. Elizabeth, Jamaica, West Indies. where we would view our grand parents tomb, he would share memories of his time spent in the US Marine Corps and how he had served France and Germany in World War II. He normally loved warm fresh bammies and drank a lot of coconut water from his nephew's coconut trees. To our cousins Dale and David and to the rest of the family be strong and remember the lovely memories we had with Uncle Harry. He was a loving, caring and soft spoken gentleman, whosoever comes in contact with him always loved and adored him, you touched a lot of lives . You gave your service and contributions to America you are indeed a hero. Rest in Peace Uncle Harry. Louie and I knew Harry though Fred Robinson of Vitas that included us with a group of WWII Veterans , Korean and Vietnam Veterans. We met up at the Marine, Army and Navy Balls and enjoyed visiting and swapping war stories. We have many pictures of these men and their wives, nieces, and friends that escorted them. I remember the big smile on their faces as they were honored by the Officers announcing honored guest and their contributions to America. It was a real privilege to get to know these American heroes. Go with God Harry you served well and long. I first met CSM Harry Shakes on the Honor Flight to the Washington Memorial about 4 years ago. He and I developed a friendship after he heard me speak and found out that I was also from Jamaica. He has blessed us by attending the US Marine Corps Birthday Ball a few times after we met. It was my privilege to have met him and I am truly thankful and grateful for his service. He was a very Charismatic person and I enjoyed listening to his life story and his time in the US Army. To his family, please accept my condolences and I pray that you all find peace in this tragic moment. Just know that your dad, granddad and brother made a big impact on this world and touched a lot of lives. He is a true HERO to many. May the Lord continue to bless you all and Rest in Peace Harry; you will be missed but never forgotten. Gunnery Sergeant Dwight Hall, US Marine Corps, Retired. Rest in heaven Command Sergeant Major. You made Cuba, Jamaica, US and the Army proud. My heartfelt condolences go out to the Shakes family. May the God of all comfort sustain you during this difficult time. Met Harry a number of years ago at a 1st cavalry reunion. Had many contacts with him since we first met. A true gentleman and a soldier’s soldier. May he Rest In Peace in “Fiddler’ Green” Harry it was my pleasure to know you and a true honor. My deepest sympathy to the family for your loss. When someone we love falls asleep in death, the memories we have if them becomes our treasure. May those cherished memories and God’s promise at John 6:49 bring you a measure of comfort and peace during this difficult time. RIP Great American Warrior! I salute you! Hugs & Prayers, Sparrow Six-Five!